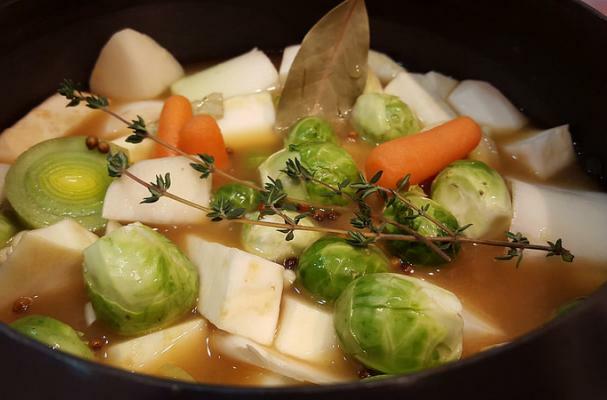 Pot-au-feu, or "pot on the fire," is a quintessential French stew of root vegetables, meat, and spices. Inexpensive cuts of beef and marrow bones are typically used and stewed long and slow on the stove along with a variety of vegetables like carrots, leeks, potatoes, onions, and turnips until fork tender. Traditionally, the broth is served first with toasted bread smeared with marrow from the bones, followed by the meat and vegetables. Our lighter version omits the beef altogether and instead celebrates the flavors of autumn's beautiful bounty. Baby carrots left whole, turnips, a parsnip or two, tender leeks, Brussels sprouts, sweet onion, celeriac, and potatoes are cooked until tender in a light and flavorful herb-studded broth. It's an easy meal that is both healthful and filling. To serve, scoop out vegetables onto individual plates with the broth in sipping bowls alongside. The vegetables are excellent with whole grain mustard, so be sure to set a crock on the table. To make sure the vegetables cook evenly, cut all the pieces the same size. Put all the ingredients except the beans into a large saucepan or stockpot and bring to a boil over medium heat, then reduce heat to low and simmer for 15-20 minutes. Add the beans and simmer for another 10 minutes, until the vegetables are tender. Serve on plates or in shallow bowls with a drizzle of extra virgin olive oil and whole grain mustard.